It may sound obvious, but we've seen plenty of videos where the camera is mounted in the corner which tends to distort the footage making for a less clear picture, especially when driving at night. 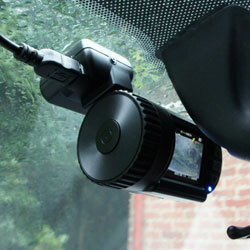 The camera should be positioned in the centre of the windscreen near the top, ideally behind the rear view mirror. Everyone loves the sky but, unless you're trying to capture the next meteorite landing, you should limit the amount of sky you capture as you drive. The more sky you have the more sunlight you get which results in more glare, reducing the quality of the video. The camera will also try to compensate for the brightness of the sky, darkening the video, which can make the detail on other vehicles harder to make out. It doesn't matter if you record more of the car dashboard - as long as you capture the road ahead. 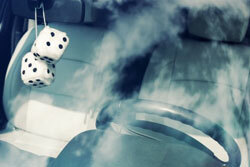 Many car cameras equipped with a g-sensor automatically lock a video clip if it detects an accident. Sometimes, the camera will lock a file by mistake when you go over a bump or take a sharp turn. You can usually tweak the sensitivity of the g-sensors to prevent your memory card filling up with locked files. Adjust to a setting which works well for you - some cars, particularly performance cars, require a less sensitive g-sensor. This is down to preference of whether you want to record sound. Personally, I prefer to mute the sound so I don't record my dreadful singing or telephone calls on the video. The important thing is the video so sound is an added bonus. It's vital that you keep your windscreen clean. Aside from being able to see where you're driving, you'll have clearer footage should you be involved in an accident. Try and clean the inside with window cleaner every month and make sure you keep your windscreen washer fluid topped up - especially in the Winter. When driving in the rain or wet conditions make sure to use your wipers to not only see where you're going (very important!) but to clear the windscreen for the camera. If you have muck or light drizzle on the windscreen the quality of the video footage will be significantly worse. All cameras provide the option to change the resolution (Full HD, HD, VGA etc.) and possibly the frame rate. Generally speaking, there is no real need for 60fps for a car camera and we recommend the highest resolution possible. When we get a new camera we always experiment with the different resolutions and frame rates to see which works best during the days and equally at night. When it comes to night time driving, many cameras come equipped with a WDR (Wide Dynamic Range) mode. This mode improve the light for night time driving but does tend to add noise to the footage which can reduce the quality of day-time footage. Generally speaking, if you drive a lot at night then it's worth using, otherwise, leave it off. Try the settings and see what works for you. You can usually change the duration of the video clips the camera creates. Whilst there is no real different between them, we find that the shorter clips are easier to manage when transferring onto your computer and playing back later. If you have objects on your dashboard these can cause glare and reflections on your windscreen. Remove as much as you can to make sure you reduce the glare to have clean footage. To ensure you can record plenty of footage before being looped, we recommend a card of at least 16GB. This should provide around 2 hours of footage before being overwritten. Additionally, we recommend a class 10 memory card which can work at higher speeds, reducing the number of memory card errors resulting in less jerky video clips. Always check the manufacturer recommendations for the speed of memory card since some cameras have trouble with higher speed cards. It's important that you take the camera out and copy the video onto your computer (or playback via your mobile device if you have a wifi/mobile enabled camera) to make sure it's working correctly. You would cry if there was an accident but your camera was off or pointing in the wrong direction! 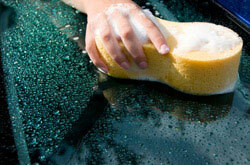 We recommend doing this every month, around the same time you clean the inside of your windscreen!